143. Epic Personal Organization Failure. 1) My organization at home is terrible! I’m organized to a nearly OCD point at work, but when it comes to personal organization I am an epic failure! Last night before my association meeting, I was scrambling to find some paperwork from my closing that I needed to provide to the association president. When it comes to important paperwork my current filing system is “Large Box of (probably) Important Papers.” This needs to be fixed, and it needs to be fixed soon. I think this is going to be my weekend project. 2) I am most productive when things are in my face. My most productive days at work are the days where I print out everything I need to get done, pull the files, and create to-do piles. Watching piles get physically smaller satisfies me in a way that checking things of just doesn’t do for me. I need to find a way to apply this to my training because I have been a MEGA-slacker this month. Any suggestions? I do actually have a bulletin board on the wall next to my desk with my training schedule tacked to it, but that hasn’t seemed to work out so well yet. Maybe I need to tweak/ move it? 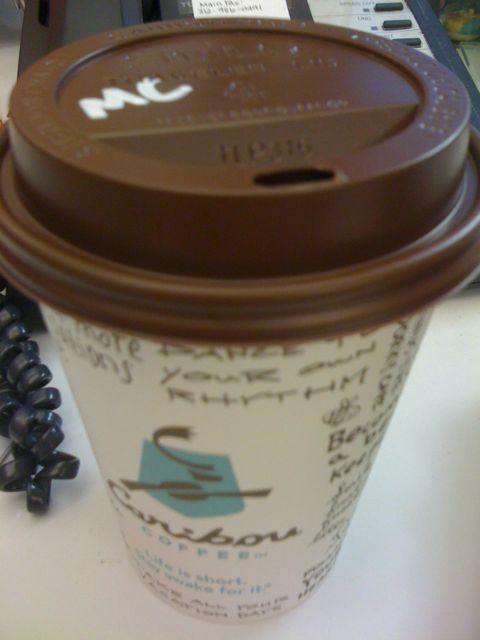 This morning when my co-worker asked if I wanted anything from Caribou Coffee, I decided to go ahead and splurge with a latte. I got the Mint Condition. It was totally yum worthy! Espresso, steam soy milk, melted dark chocolate, a shot of mint syrup, and bits of Andes mints! How can you go wrong with mint and chocolate? 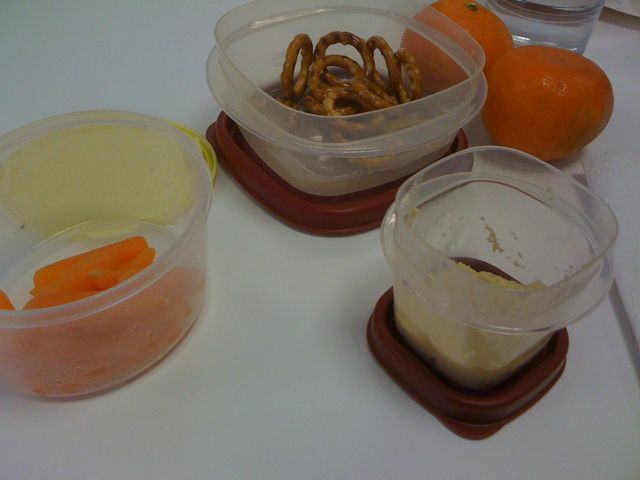 Lunch was homemade hummus with carrots and pretzels as well as a couple mandarin oranges.